I was checking on today's closing & saw a BEARISH ENGULFING candle at close. Hence, did a quick analysis on FKLI. Previously, on Dec 24, price touched an all-time high of 1,685.5, albeit closing lower at 1,676 on that day. Yesterday (Dec 26), we managed a close at fresh high of 1,681.5, the first close above Oct'12 peak of 1,678. However, today, selling pressure took over late afternoon, pushing price down to close near day's low of 1,675, a first close below the trendline supporting the extended Wave C rally. A close in a dreaded Bearish Engulfing candle further amplified the bearishness in the afternoon. I've been waiting long enough to SHORT this dragging rally top, today's candle just gave a reminder for me to start monitoring FKLI again, after being away from the market for over a week. Anyway, I will be smart enough to avoid a SHORT before the year's close. I will keep an eye on the price movement & take my position, if any, in the fresh contract month of Jan'13, instead. Meanwhile, let's watch if the bearish engulfing candle gets a confirmation in the last two days of trading for the Year 2012. I haven't see strong reversal signal on the underlying FBMKLCI yet. It seems like there's some confusion among readers regarding my posts. my analysis are mostly targeting short-term gyration in the market, over 1day to a couple of days. The technical term for it would be 'Swing Trading'. u may be BULLISH Dec'12 through to Feb'13. With Mar'13 carrying GE-13 uncertainties. u might have already shorted the FKLI when it could not breach the 1,684-85 resistance during the day (Dec 27) itself, even before it managed to close with slight bearishness. You could have easily scooped a nice 6-8pts profit for the day. I usually analyze the bigger trend, over a few weeks or months, to gauge the general direction of the market. For FKLI, I'll do that at the end of each month. To summarize price movement over the month & also to update the change of trend/sentiment, if any. my daily postings updates previous/the day's price movement, do TA, combining major macroeconomic data due for release, all that could potentially dictate the direction for the ensuing day(s). Hope this gives a clearer picture of my postings. I will work on categorizing my posts, bring in more educational stuff, & other items as suggested by some of my readers. Your comments is much appreciated. 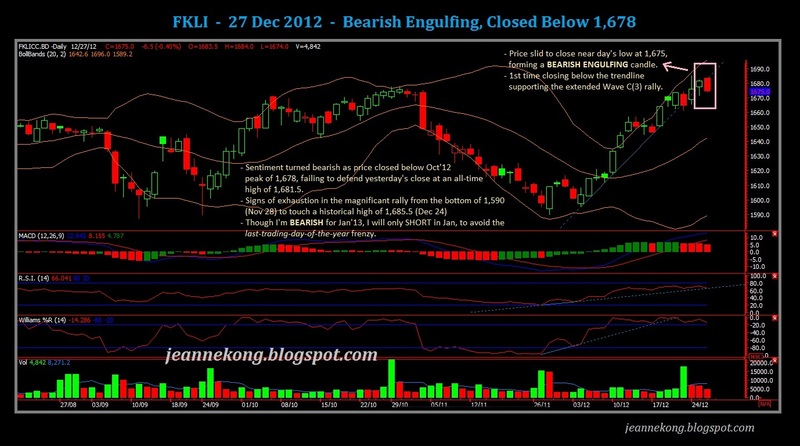 FKLI closed at 1,684.5, slightly over yesterday's bearish engulfing candle's high. Plus, coming Monday will be the last trading day for 2012, watch out for window-dressing spike. I still maintain slight bearishness into early Jan'13. Followed by mild bullishness for a CNY rally. After CNY, uncertainties may haunt the market until GE announcement & dismiss of The Parliament.